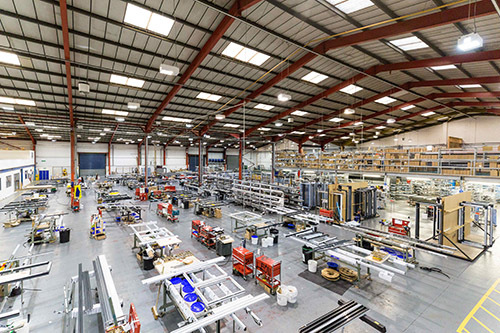 One of the UK’s biggest and best known aluminium folding door specialists, Express Bi-folding Doors, has integrated its software set up using BM Aluminium’s LogiKal system to help it manage its impressive ongoing growth. Led by Express Bi-folding Doors’ Senior Business Analyst Mark Gregoire in partnership with Dan Hodges and Perry Mace from BM Aluminium, the aim of the project was to achieve better synergy between the systems being used in different departments to create a greater level of transparency. Previously, Express Bi-folding Doors had used several different proprietary software programmes provided by the systems companies it works with, including Schüco and Smarts, as well as two stand alone versions of LogiKal – one open and one closed. While this was manageable several years ago when the Leeds based business was turning over £5m, Mark felt that it was limiting efficiency now that the turnover is closer to £26m, and leaving too much potential for errors. 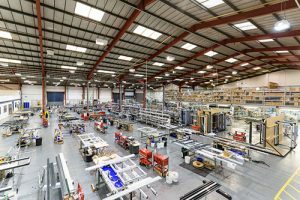 He approached BM Aluminium at the end of 2017 to develop a solution which was more appropriate for the requirements of the business as it continues to expand, with the implementation project beginning at the start of 2018. The LogiKal installation now manages all order processing and manufacturing at Express Bi-folding Doors, linking to Schüco, Emmegi and Elumatec saws, as well as two CNCs and an Emmegi Quadra machining centre. Efficiency has increased dramatically with position library templates helping to standardise production and outputs. It has been a largely bespoke installation, since the Express Bi-folding Doors product range includes many non standard products, some even using profile and cill combinations from different manufacturers. BM Aluminium’s programming team have opened individual system databases to each other and produced bespoke spreadsheets on bills of materials to facilitate automatic stock reordering.